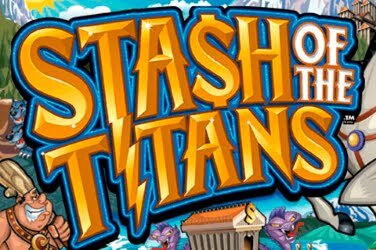 The Stash of the Titans slots game released in HTML5 has 5 reels and 20 winning pay lines. It was created by Microgaming to be included in their many online casinos. As the name may suggest, it is based upon Greek Mythology and the Titans that were proclaimed to exist at that time. Players can enjoy the various characters that are found upon the reels of the Stash of the Titans slots game. These include Perseus, the hero who slew Medusa, sitting astride Pegasus the winged horse. There is also Hydra, the many-headed serpent, and the one-eyed giant Cyclops. Other symbols include the Griffin with the head of an eagle and the body of a lion. The bulled headed male Minotaur, and the half man half horse Centaur. Players will also find the symbol of the 3 headed dogs Cerberus, who was said to guard Hades. Finally, there is the half man half goat Satyr symbol which is used in the Stash of the Titans slots game. Medusa the Gorgon with her snakes for hair and the ability to turn people to stone is the games Scatter. While the Stash of the Titans Logo acts as this slots games Wild symbol. 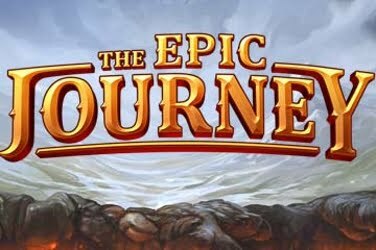 All the graphics are highly detailed, with the background of Stash of the Titans slots showing a view of the mountains. Players can see the clear blue sky and various Greek Temples. The designers of the Stash of the Titans slots game chose to opt for a cartoon caricature style for its characters. All of which are animated in various ways. For example, players can watch Perseus and Pegasus take to the skies when they create a winning combination. The Stash of the Titans Logo symbol is used as the games Wild. 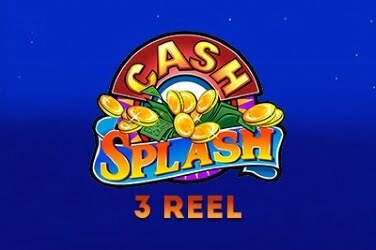 When it appears on the 5 reels of the game it can create a winning payline as it changes another symbol. The only icon the Wild is unable to change is the games Scatter. There are guaranteed wins for any amount of Wild icons that are spun up on the reels of the Stash of the Titans slots game. Should only one appearance, then any winnings are doubled. These amounts are then 4x, 6x, 8x, and 10x respectively after this. Medusa the Gorgon is the symbol which acts as the Scatter in the Stash of the Titans slots game. If 2 appear during a spin, then a set pay-out amount is awarded to the player. However, if 5 are spun then a 50x Multiplier is added to the original wagered amount. When 3 or more of the Medusa the Gorgon symbols are revealed in the Stash of the Titans slots game then a Free Spin Bonus Round is activated. 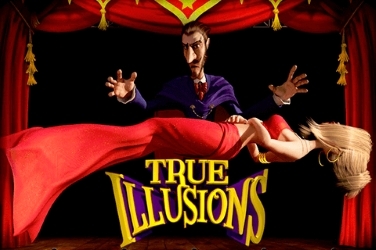 15x Free Spins are given to the player, along with an additional 4x Multiplier. 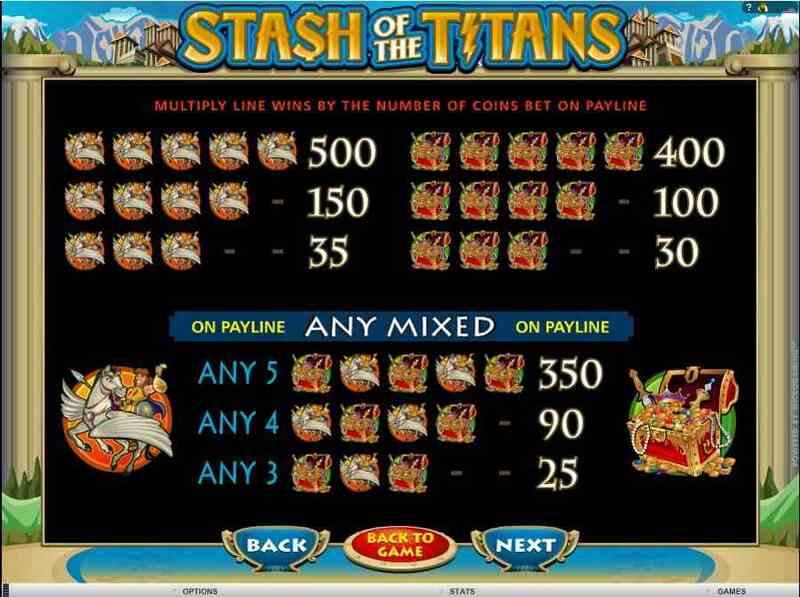 Various jackpots are available to players during gameplay of Stash of the Titans slots. 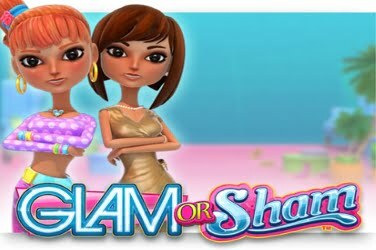 However, they are quite low which may not make this Microgaming online slots game unpopular with high rollers. The highest jackpot in the Stash of Titans slots game is just 500 coins. This is added to the payout amount when 5 Perseus symbols are revealed across the reels of the game. Should the symbols be a Treasure Chest, then 400 coins are given. A lower jackpot can be won in the Stash of the Titans slots game. This is just 350 coins and is awarded if there is a combination of the Perseus and Treasure Chest symbols filling the 5 reels of the game. ( Now available on mobile version ) Wagers in the Stash of the Titans slots game can be a 200 coin maximum. Coin sizes that are used in the game are from just $0.01 to $0.20. This can make this Microgaming online casino game appealing to players of all levels. 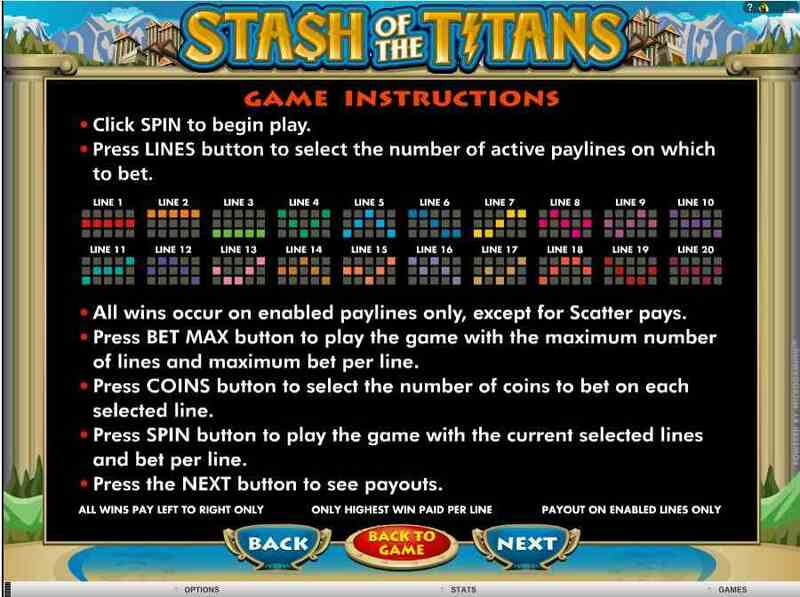 Players are able to place a wager upon any of the 20 winning paylines that the Stash of the Titans slots game provides. With pay-outs given for the games various combinations, a player has plenty of chances to add to their final total amount. 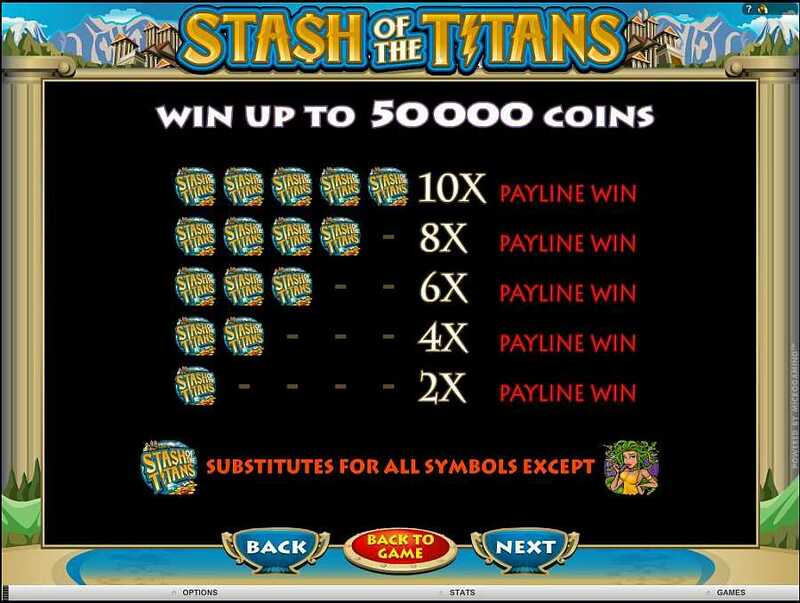 The Stash of the Titans slots game offers the player additional features which can all help to add to their winning amount. 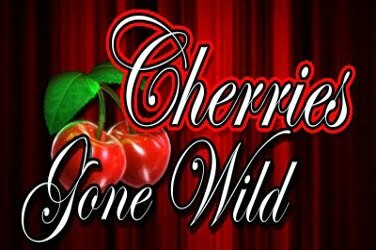 There are the Wilds and Scatters which are usual in many of the Microgaming online casino games. 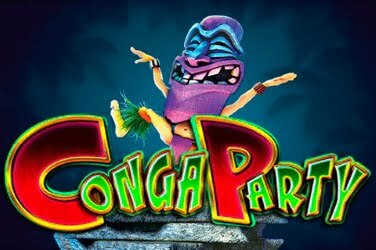 In addition, there is also the chance to win jackpot amounts and to activate the Free Spins Bonus Round. Stash of the Titans slots is a lively and cheerful online game that can provide hours of fun with the chance of some large pay-outs. 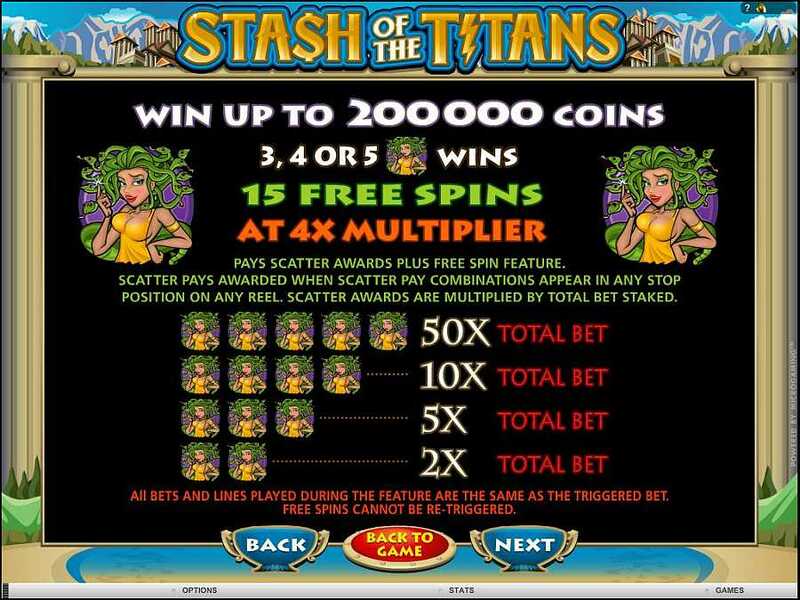 Stash Of The Titans is a non-progressive 5 reel 20 pay-line video slot machine game from Microgaming, it has a Greek Mythology theme, and comes with a wild symbol, scatter symbol, multiplier, free spins and has a maximum jackpot win of $10,000.